The theme uses CSS3 media queries to automatically switch the layout of the admin area to fit perfectly on any device, from desktop computers to tablets and mobile devices. Installing BetterWHMCS is extremely easy, simply follow the steps below. In the BetterWHMCSv1-6 folder, open up "WHMCS Directory". If you have a custom WHMCS admin directory, rename the 'admin' folder to the appropriate directory name. Copy all folders within "WHMCS Directory", and upload it to the root of your WHMCS installation using your favorite FTP program. 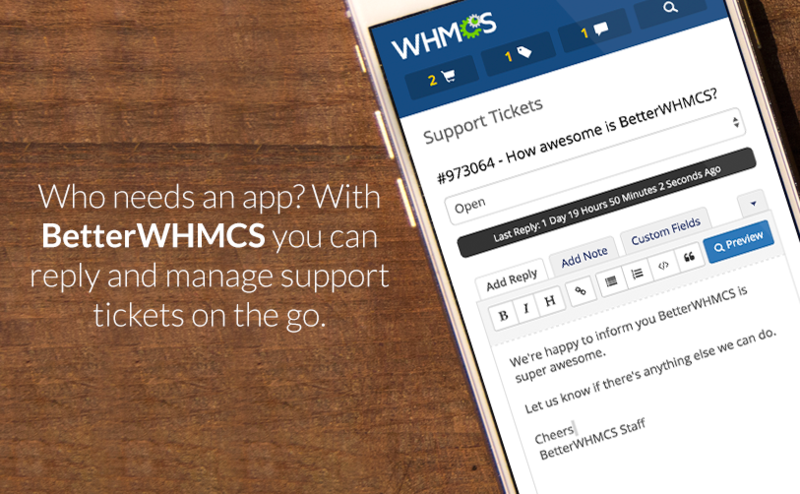 Any questions or support inquiries can be submitted by clicking the Get Support button on the BetterWHMCS Website. A demo is also available on request. Based on price and functionality, though, I probably would have gone with the Lara theme if I had known about it when I bought this - it's cheaper with more options. Amazing theme, and an even more amazing developer. My email was answered within 15 minutes, and I definitely did receive a confirmation email, despite the review below me emphatically claiming otherwise. Installation instructions were as clear as could be, and the process from purchase to installation could not have been easier. This is one of best products on the marketplace, and at $20 it's an absolute steal. The worst, silliest support modal I have ever seen in my entire life. No confirmation regarding that they've received the request. No reply. Nothing. By the way, I'm happy to see positive comments here but somehow it didn't work for us. 1- First of all, they don't know the hooks system can be able to disable by the config file. Their one and only support sentence was about admin path. 2- Their website doesn't meet any webshop standards. No support, no contact information, nothing. Just a contact form which has even doesn't have a subject field. And if you want to use it, be ready, black hole! No confirmation email, no received reply. Space!! You even don't know if they received or if you were able to send. Mystical email form. 3- They have no support documents, how-to or FAQ. If they have a single wiki page such as "Your support request will reply within 24 hours" I did not bother myself to deal with this kind of scam people who acts like a company. 5- They are mean. This is interesting. You know there is a saying "Mean people are no fun." That's it. Simple and true. So my company was established 16 years ago. And in this period I had to deal with tons of companies, freelancers, developers. But this is the first time that I met a person like that. He blames us where he needs to be embarrassed. This is our place people, who care about the customers, who cares about the community, people, sharing. Please do not allow this kind of people. Your support reply was answered within 24 hours (on a Saturday no less), which is more than acceptable. Since the 24 hours this customer submitted his ticket, he's sent 3 more replies claiming we have the worst support in world, similar to what he's left here in his bullying review. This customer is a reminder of why doing business on the internet can be so unpleasant at times. Out of everyone who loves your product, there will always be an individual who's life seems to revolve around creating conflict on the internet. This customer's purchase was refunded, and his account cancelled. 1. Not really sure what you're trying to say here. 2. Web shop standards? There's a ticket submission form, which gives you a confirmation, both when you hit the submit button, and by email. 3. There are installation instructions both on our Marketplace listing, and in the theme download folder. 5. The saying "mean people are no fun" is absolutely right. Since this customer has purchased the theme, we've been called "scammers", "scam people who acts like a company", "the worst, support he's ever seen in his entire life". This is by far the meanest individual we've dealt with to date. Despite this customer (who's purchase was refunded) trying to find reasons to belittle every aspect of this theme, the entire basis around this customer's angst is based on the fact his email took up to 24 hours to reply. There are some clients which you will never be able to please, or simply want to find a reason to harass you. I stand by my product, and can confidently let the rest of the reviews on this listing speak to that. Excellent theme. Looks so much better than the default one WHMCS uses. Well worth the price. This is a serious improvement on the dated WHMCS admin theme. I contacted support for help with a very unique issue and received a resolution the same day. I highly recommend BetterWHMCS to anyone. Contacted support 2 times but never received a reply.. It works very well.. Found some bugs but dont know how to contact support to fix them. THanks! Hey Santiago, our system had some mail delivery problems which have since been resolved. Your email has been replied to. Thanks for your review! After losing my mind with the iWHMCS app and the total lack of updates and support from WHMCS directly, I sought out to find the next best thing. This is definitely it! 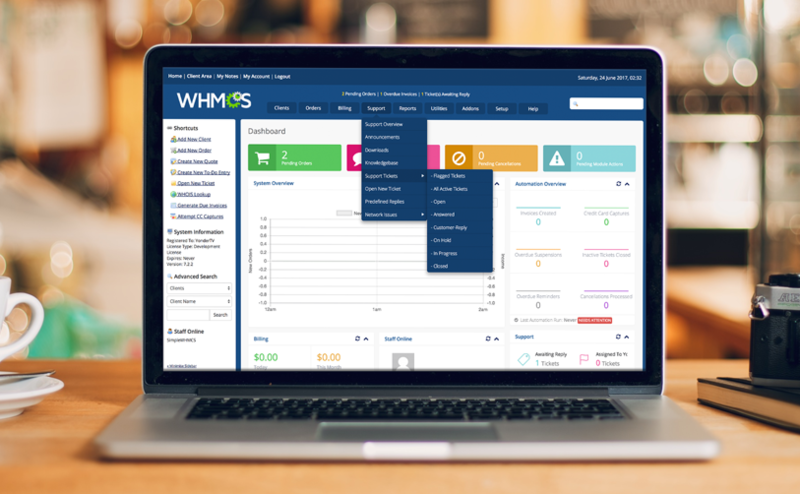 Accessing WHMCS from my phone or tablet while out on the road could not be any easier. This is a job well done! I can't say the same about the support, as I've sent in an email and yet to receive a response for a few days now, but the product itself is definite worth the $20 and wins an easy 5 stars. I literally had tears in my eyes when I seen how amazing this admin theme is. Quick setup to the point you're perplexed about being finished already. Put some pancake sausage sticks in the oven and before it was time to turn them, I had installed already. This mutha luvin clucka is THE MAN!!!!!!!! If you're looking for a mobile device friendly theme, look no further. I've tried 3 different themes available on the marketplace and none of them perform as well as this theme does on mobile. Excellent work. Excellent mobile admin theme and very excellent support. I was having a small problem and their support was amazing and helped me fix the problem quickly. I wished all authors performed at this level. Thanks for the great theme! The mobile version is amazing but I did not like the style in desktop. Support released a version with new settings to enable/disable the them on desktop and now I am using the default style for desktop and BetterWHMCS for mobile. Excellent theme, works impressively on mobile even with detailed and complicated management tasks. Desktop theme is also a welcome improvement over the default blend WHMCS theme (and all the others they provide for that matter). Well worth the 20 dollars, I would have happily paid even more. Best theme on the marketplace, hands down. This theme was exactly what I was looking for, and functions spectacularly on mobile devices. If you're looking for a mobile friendly theme, there is no better theme on the app store. I've been using this theme for the past couple of months and I must say that it vast improvement on the default admin theme. 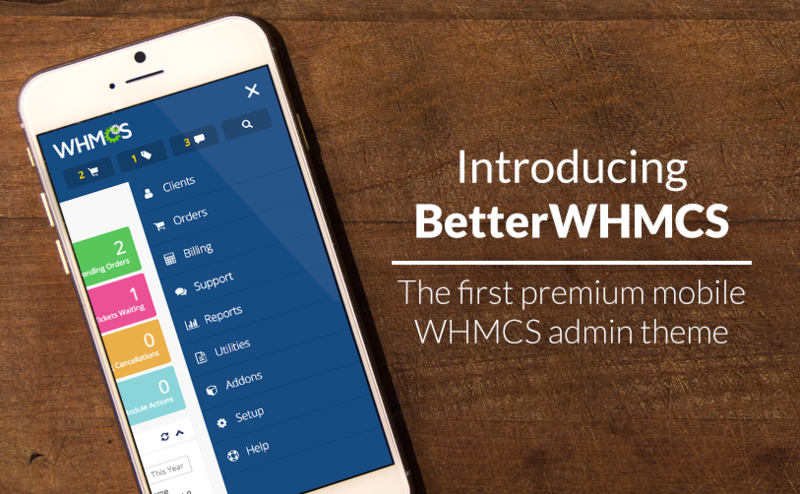 Managing WHMCS via mobile is now a breeze with the mobile responsive improvements made with this theme. I highly recommended it. Support for the theme is also great. There was a slight compatibility issue when V7.1.0 was released, and after notifying support of the issue, an updated theme version was released very quickly. I registered to marketplace just to write a review on this excellent product. From ordering, paying to installing and using the theme took me only 5 min! The whole process was simple and straight forward. I wish every online purchase experience was as good as this one. Moreover, the price is quite affordable. WHMCS should buy this theme and make it the default for future versions. Been using this theme for about 3 weeks, and I'm still blown away by the attention to detail throughout this theme. I highly recommend this theme to anyone tired of WHMCS's lackluster default interface. My staff is LOVING the new theme. It's not just the ability to manage tickets on the go, but the entire WHMCS admin area is so much nicer than the default template. Excellent work. Best theme on the marketplace, period. Mobile only functionality. This can be enabled by editing the BetterSETTINGS.php action hook variable $mobileOnly to 'on'.